Who doesn't love Chinese takeout? Making your own fried rice at home means you can control the oil and sodium content. 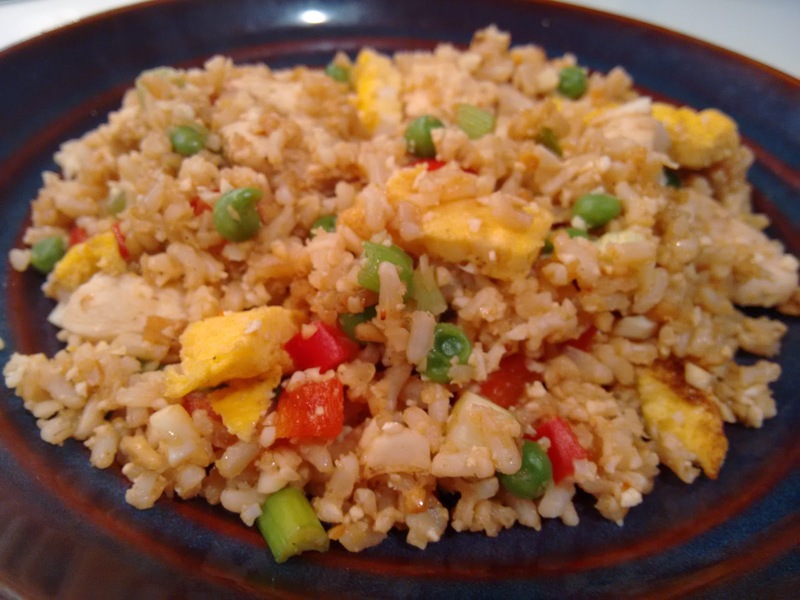 I've seen recipes for cauliflower "fried rice" lately that seemed like a great way to sneak in some extra veggies! For this recipe, I opted for a blend of brown rice and cauliflower. You can use all rice or all cauliflower if you like, but I did half and half (about 2.5 cups each). This recipe can also be made with shrimp or pork, and you can swap peanuts for cashews. Since I ate this as my main dish, I calculated the nutrition information as four servings, but it could be counted as eight servings if you serve it as a side. In a food processor, grind peanuts. Pour into a small bowl and set aside. Next, add cauliflower to food processor, and grind to rice-sized pieces, and set aside. In a small frying pan, pour the eggs in and cook like an omelet. Slice the omelet into thin strips. Set aside. In a large wok, add 1 tsp sesame oil, chicken pieces, and black pepper and cook over medium heat until chicken is cooked through and lightly browned. Set chicken aside. Pour remaining sesame oil into wok, then increase heat to high and add vegetables. Stir frequently. While vegetables are cooking, mix soy sauce, ginger, sriracha, sugar and oyster sauce in a small bowl. Add cold rice into wok, and cook until rice is heated through. Pour sauce on top, then add ground peanuts and chicken. Stir to coat all ingredients in sauce. Add egg slices in, stir, and serve.